Set up Azure Dev Spaces with a managed Kubernetes cluster in Azure. 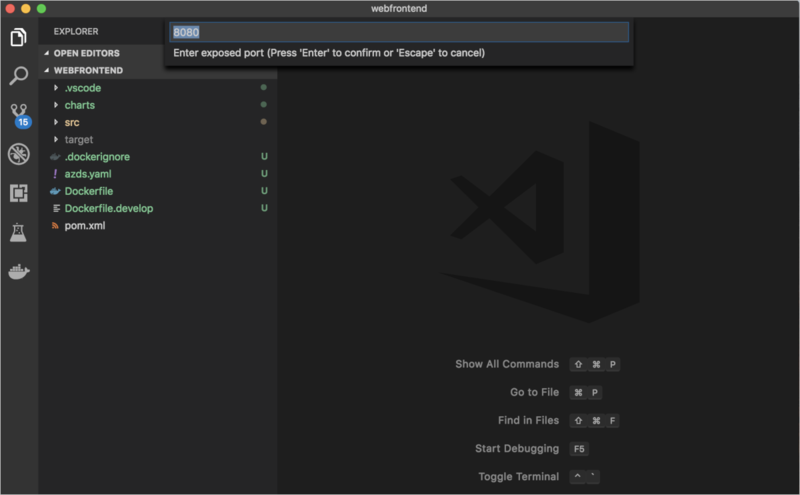 Iteratively develop code in containers using Visual Studio Code and the command line. Debug the code in your dev space from Visual Studio Code. An Azure subscription. If you don't have one, you can create a free account. The Azure Dev Spaces and Java Debugger for Azure Dev Spaces extensions for Visual Studio Code installed. You need to create an AKS cluster in a supported region. The below commands create a resource group called MyResourceGroup and an AKS cluster called MyAKS. Use the use-dev-spaces command to enable Dev Spaces on your AKS cluster and follow the prompts. The below command enables Dev Spaces on the MyAKS cluster in the MyResourceGroup group and creates a default dev space. In this article, you use the Azure Dev Spaces sample application to demonstrate using Azure Dev Spaces. You must run the prep command from the dev-spaces/samples/java/getting-started/webfrontend directory to correctly generate the Docker and Helm chart assets. You can see the service running by opening the public URL, which is displayed in the output from the azds up command. In this example, the public URL is http://webfrontend.1234567890abcdef1234.eus.azds.io/. If you stop the azds up command using Ctrl+c, the service will continue to run in AKS, and the public URL will remain available. If azds up is still running, press Ctrl+c. Navigate to your running service and observe your changes. Press Ctrl+c to stop the azds up command. Open Visual Studio Code, click File then Open..., navigate to the dev-spaces/samples/java/getting-started/webfrontend directory, and click Open. You now have the webfrontend project open in Visual Studio Code, which is the same service you ran using the azds up command. To debug this service in AKS using Visual Studio Code, as opposed to using azds up directly, you need to prepare this project to use Visual Studio Code to communicate with your dev space. To open the Command Palette in Visual Studio Code, click View then Command Palette. Begin typing Azure Dev Spaces and click on Azure Dev Spaces: Prepare configuration files for Azure Dev Spaces. When Visual Studio Code also prompts you to configure your base images and exposed port, choose Azul Zulu OpenJDK for Azure (Free LTS) for the base image and 8080 for the exposed port. This command prepares your project to run in Azure Dev Spaces directly from Visual Studio Code. It also generates a .vscode directory with debugging configuration at the root of your project. Click on the Debug icon on the left and click Launch Java Program (AZDS) at the top. This command builds and runs your service in Azure Dev Spaces in debugging mode. The Terminal window at the bottom shows the build output and URLs for your service running Azure Dev Spaces. The Debug Console shows the log output. If you don't see any Azure Dev Spaces commands in the Command Palette, make sure you have installed the Visual Studio Code extension for Azure Dev Spaces. Also verify you opened the dev-spaces/samples/java/getting-started/webfrontend directory in Visual Studio Code. Click Debug then Stop Debugging to stop the debugger. 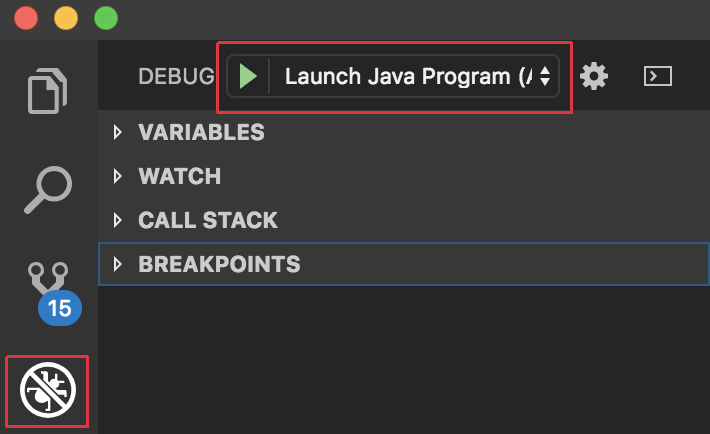 Start your service in debugging mode using Launch Java Program (AZDS). Navigate back to the Explorer view by clicking View then Explorer. Open src/main/java/com/ms/sample/webfrontend/Application.java and click somewhere on line 16 to put your cursor there. To set a breakpoint hit F9 or click Debug then Toggle Breakpoint. Open your service in a browser and notice no message is displayed. Return to Visual Studio Code and observe line 16 is highlighted. The breakpoint you set has paused the service at line 16. To resume the service, hit F5 or click Debug then Continue. Return to your browser and notice the message is now displayed. While running your service in Kubernetes with a debugger attached, you have full access to debug information such as the call stack, local variables, and exception information. Remove the breakpoint by putting your cursor on line 16 in src/main/java/com/ms/sample/webfrontend/Application.java and hitting F9. Save the file. Click Debug then Restart Debugging or in the Debug toolbar, click the Restart Debugging button. Open your service in a browser and notice your updated message is displayed. Instead of rebuilding and redeploying a new container image each time code edits are made, Azure Dev Spaces incrementally recompiles code within the existing container to provide a faster edit/debug loop. Learn how Azure Dev Spaces helps you develop more complex applications across multiple containers, and how you can simplify collaborative development by working with different versions or branches of your code in different spaces.